There are 4 basic fuel injector cleaning methods available. Annually millions of dollars are being spend on them. The question is which one of these methods does the best job and why? In the hope of supplying the reader with more information we did a hands on review of the most popular injector cleaning methods available to the general public. With an accurate air fuel ratio analyzer and load bearing chassis dyno at our disposal we were able to test under various engine loads and speeds. 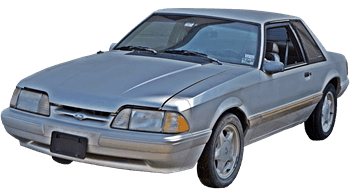 For the project a 1993 Ford Mustang Lx with 135 k miles on the odometer was used. The car was not driven for approximately two months prior to the experiment. First a compression and a leak-down test was done. Both checked out fine. Then the fuel tank was drained. Although the fuel was slightly discolored it had not developed a bad odor and there was no indication of phase separation. 10 Gallons of fresh gas was poured into the tank and an Autronic model B air fuel analyzer was hooked up to the tailpipe. Upon startup the engine had a little stumble but once the engine was warm it ran “fairly” smooth. Throttle response was fair and slight misfires were present under free revving. The car was taken on a road trip consisting of some open road and some stop and go driving. Although at cruise the engine ran fairly smooth the Air Fuel Ratio (AFR) constantly indicating that the engine was running between lean and rich. Stop and go driving showed huge lean-rich fluctuations. Wide open throttle acceleration was very sluggish and produced misfires. Back at the shop the fuel tank was emptied into a 5 gallon measuring can. 1.85 Gallons was recorded. Based on this we used 8.15 gallons of gas for the 102.7 mile trip, resulting in an average fuel consumption of 12.6 miles per gallon. Based on engine size, fuel injector size and fuel type being used etc. we calculated that the car should be able to produce 85 – 90 horsepower to the wheels. We added 5 gallons of fresh gas and ran the car on a load bearing chassis dynamometer. AFR ratios indicated lean engine conditions and the car produced 72 HP. That’s about 15% less than expected. The old spark plugs was removed and checked. All indicated a lean condition. New spark plugs that was gaped to the correct size was installed and again the car produced 72 hp. The air filter was replaced, again 72 HP Then the fuel filter was replaced and again the car produced 72 HP. During dyno testing the fuel pressure stayed constant at 43 – 45 psi under full load, indicating a healthy fuel pump. Based on the above we felt that the fuel injectors in the car was dirty and need cleaning. We removed the injector and flow tested them. The results were as follows 156, 168, 180 and 172 cc/min. The first injector cleaning method we wanted to test was the Injector Cleaner method. Also known as injector cleaning additives. We installed the injectors without cleaning them. We drained the fuel tank, measured out 5 gallons of fresh gas but this time we added a quality brand name fuel injector cleaner to the exact specification of the manufacturer. Cost for the injector cleaner was $12.50. Within a couple of minutes after start-up we noticed the engine started to run a little rougher. This time the car would only produce 63 HP on the first dyno pull but could not complete a second dyno pull because the engine bogged down and started to misfire badly. The AFR went lean indicating an AFR of 17:1 and up. Now the engine would not maintain idle and had to be kept alive by means of additional throttle input. We removed the fuel injector and flow tested them. This time the injectors flowed 128, 162, 136 and 122. In addition two of the injectors was now leaking. The injector cleaner loosen dirt in the fuel line and rail and partially clogged the injectors. Injector cleaners might be inexpensive but be careful because there use can have disastrous consequences. We re-installed the injectors without cleaning them. This time we used fuel rail induced high pressure injector cleaner. Cost at a dealer or an auto repair shop for doing this procedure would vary between $225.00 and $350.00. After the process the engine just managed to run without additional input but as soon as the throttle was touched the engine would die. Starting became hard and a fuel smell was noticeable during cranking. Needless to say that strapping the car down on the dyno was a waste of time. Injector flow testing revealed 142, 154, 146 and 128 but now all 4 injectors are leaking. We noticed that two of the injectors now has damaged filter baskets. We removed the rest of the damaged filter baskets from the injectors and proceeded to back flush them. Apart from the normal dirt expected, filter basket material was present in the debris. We again leak tested the two injectors that we back flushed. Flow went back up to 168 and 180 and this time they were not leaking. The rail induced procedure damaged the filter baskets on some injectors. On some injectors small chunks of debris was forced past the filter baskets and some chunks was loosen from the pintle shafts. Those pieces was too big to pass through the pintle and seat, and lodge itself between the pintle and seat causing the injector to leak. On the other injectors debris and filter basket material lodge itself between the pintle seats. Exactly what we told the dealer is happening when they perform their cleaning process. Not to side step the proponents of the DIY cleaning process we rigged up a 12 volt auto battery with a push type on of switch, a syringe with carburetor cleaner and followed the procedure as described in some of the YouTube videos. To make sure that we do a “thorough job” we repeated the process 5 times per injector and then back to the flow bench. The results 172, 174, 180 and 174 cc/min. We saw a small improvement from the original flow test. It was minor and not enough to warrant additional dyno time. It is our opinion that the DIY injector cleaning methods might remove some loose debris but because the actual cleaning fluid does not stay in contact with the internal injector components for any extended period of time it cannot dissolve or loosen the baked on hydrocarbons or harden shellac. Finally the fuel injector were put through a full ultrasonic fuel injector cleaning process. This injector cleaning method requires about 45 – 60 minutes in the ultrasonic bath. Afterwards the injectors was flow tested and this time the results was 192, 192, 194 and 192. New filter baskets and O-rings was installed. The injectors was installed using PTFE O-ring grease on the O-rings on both the manifold and fuel rail side. The vehicle produced 87 HP on the dyno and AFR’s stayed within an acceptable range during full power loads. Once again we drained all the gas and re added exactly 10 gallons of fresh gas. We proceeded to complete the exact road and city trip we did in the beginning. This time we used 5.1 gallons of gas thus recording an average fuel consumption of 20.13 MPG. A fuel consumption decrees of 80%. Although injector cleaner is cheap and “might” work, extra precaution should be taken especially when used on older fuel systems. We recommend fuel injector cleaners as a “maintenance” item and a precautionary solution on newer cars rather than a solution to cleaning fuel injectors. Based on our test on the above vehicle and subsequent newer models, a whole new range of variables are introduced when using high pressure fuel rail induced injector cleaner. Some of these variables can have costly result. It is expensive and we do not recommend its use on older fuel systems. We also caution its use in newer fuel systems. Proofed by our “injector cleaning methods” comparison test we belief that ultrasonic cleaning of the injectors when removed from the engine delivers not only the best results but it is the only method that can actually guarantee a better result. Easy to use, anyone can do it. No way of accurately knowing if any or all the injectors has been cleaned or how well each one is performing. Internal injector components, O2 sensors, and catalytic converters can be damaged due to the harsh chemicals. Some auto makers advise against the use of these products. Problems such as partially clogged filter baskets, leaking injectors, weak pintle springs and more cannot be identified. Uneven and or correct injector flow cannot be measured. O-rings that has become hard and cracked cannot be replaced. Can cause more clogging which can lead to serious engine damage such as detonation and knock. Warning: do not use on older fuel systems or fuel systems that was contaminated with old and or bad gas. In car pressure induced injector cleaning method. This method is used by many dealers, repair shops and quick oil change places. A cleaning solution is forced into the fuel rail to clean the injectors while the engine is running. “Might” deliver faster results than with in tank cleaners. Due to a higher concentration of harsh chemicals there is a greater risk to damage injector components, O2 sensors, catalytic converters and other electronic components. Can dislodge particles that build up under the filter and allow them to clog the injector tip. Dislodge particles that build up under the filter can be forced between the pintle housing and shaft, causing the pintle to get stuck in the open position. Partially clogged filter baskets, leaking injectors, weak springs, poor spray patterns and other possible problems cannot be identified. No way of accurately knowing if the injectors have been cleaned or how well each one is operating. Ultrasonic cleaning with fuel injectors removed from the engine. Injectors are tested for coil resistance, leaks, spray pattern, and flow rate. Week pintle return springs can be detected. Injectors are tested side by side thus allowing for accurate flow comparison. Proper spray patterns are visually checked and confirmed. Accurate flow rates are determined. Injector RX cleaning solutions are safe, biodegradable and never enter your engine. Cleaning method cannot harm the injector components. New parts such as O-rings, filters, and pintle caps are installed. Before and after data sheets are provided. Absolutely the safest and best way to clean injectors. The only method that can guarantee that your injectors are actually clean and function the way they are intended to do. Injectors require removal from the car and taken or sent to a specialist. Please Share This Article, Choose Your Platform!